The HDS14LSXE alignment lift is the "limo style" version of the HDS14LSX. Compared to the standard length version, this lift extends the overall length of the lift, as well as the runways, by 762 mm. This significant increase makes it possible to load longer cars, trucks, SUVs and even some limousines. This model is essential for hundreds, if not thousands, of shops across the country. Busy bays are going to service a variety of vehicles, and depending where you work, you're likely to get some exceptionally big vehicles in need of alignment services. This model all but guarantees you'll be ready to handle anything. With a 6,350-kg. capacity, the HD14SLXE lifts virtually all residential vehicles, from sedans to heavy-duty pick-up trucks to municipal vehicles and farming equipment. Turn plates in the front and multi-caster slip plates in the back allow for perfectly precise, free-floating alignments. Aluminum-alloy construction turn plates are easily positioned using BendPak’s turn plate pockets. Larger and more robust than our previous slip-plate design, they're also lighter in construction and feature dual "popsicle gap stops" for your convenience. Angled steel lock pins conveniently hold the plate in place when you want to use your machine strictly as a maintenance or storage lift. To increase longevity, ensure low cost of ownership and keep your purchase low-maintenance over time, we use the biggest and best sheaves throughout the ​lift. Massive ​267 mm diameter cable sheaves are held within the runway cross tubes, outfitted with 57 mm diameter sheave axles that are equally durable. These cables are meant to be used continuously for years on end without issue. They're extremely resistant to rubbing and other abrasions (e.g., weather, chemicals, hydraulic oil). A 13 mm diameter 6 x 25 aircraft-quality stainless-steel lifting cable runs through each column. No need to reach or bend for the turn plates. Every few inches, a convenient built-in safety lock will let the runways auto-engage into the post. All locks engage simultaneously as the runways evenly ascend the columns. Grease fittings make it easy to focus on the alignment of your wheels without worrying about the constant lubrication of the sheaves. You'll probably never experience a hose rupture, but we have you covered just in case. BendPak's unique hydraulic flow divider provides a smooth descent, making your alignment lift structure safe to operate at all times. As the alignment lift runways rise to your preferred service level, springs "snap" and hold the locks into place at each ladder position. The spring-loaded, multi-locking devices are adjustable. The design also compensates for slight slopes in your garage. A simple push-button pneumatic lock release simplifies lowering operations. Stainless steel and aluminum pneumatic cylinders provide years of maintenance-free service. BendPak doesn't cut corners on safety, even going above and beyond required safety standards. We offer a slack-cable lock system as a backup safety mechanism that’s ready at all times to shut off the alignment lift in the development of dangerous cable slack. The cables, sheaves, airlines and hydraulic cylinder run within the ​lift structure. This congregation of high safety and improved aesthetics gives our lifts a highly distinguished look that also increases user safety and comfort. The zero-maintenance power system features ergonomically located controls for easy operator access during repetitive daily use. Liquids and hazardous oil spills will not hinder the grip of the runways. Your customers' vehicles will always rotate on the turn plates without slipping off the ramps. The runway surface is rugged enough to hold tires in all shop conditions. Longer ramps make it easier to load low ground-clearance vehicles onto the car lift structure. Alignments on these vehicle types are no hassle, and of course, larger trucks and SUVs can glide on just as easily as low ground-clearance sports cars. An extra-tough yet flexible conduit protects all airlines and hydraulic hoses from daily wear. You'll handle your alignment lift with greater confidence knowing the cables won’t deliver sudden shocks, ruptures or fluid leaks. 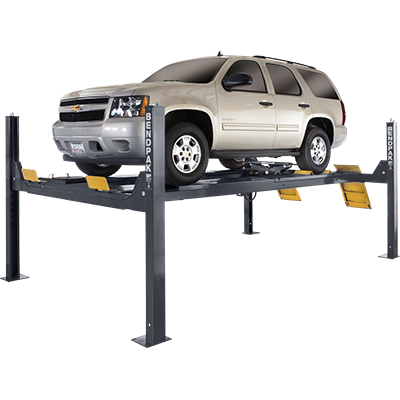 Convert your four-post into a fully functional wheel service ​lift. Optional rolling jacking beams make a great addition and increase service capacity. Bridge jacks raise vehicles by the frame, so wheel and brake service can be performed without moving the vehicle to a different car ​lift. Telescoping arms and frame contact pads extend over runways and target the vehicle's lifting points. Runways are fully adjustable for different tread widths. Three locking positions offer additional operator control.